Charming cottage, on a quiet country road, very private, newly remodeled, overlooking pastoral views of fields and mountains. Pristine clean, 3-bedroom, 2-bathroom, beautifully furnished including exquisite rugs, just 4 miles outside the Village of Woodstock. Includes all amenities, this property is close to shopping, hiking, dining, skiing, antiquing, art galleries, and the wonderful Farmers Market, just 2 miles away. Cozy and yet plenty of space for 6 adults. There are outdoor spaces to enjoy, 2 decks for dining and views, and loads of windows create a light-filled comfortable vacation spot. 2-car detached garage. Owners have tastefully furnished this home with everything visitors would need for a lovely place in the mountains. Owners have a reputation for having created other exquisite rental properties in the area. The ideal location for those seeking convenience, a pristine home, privacy, and relaxation. Well-known Homeaway property owner, this is the newest property just acquired after selling my other two homes. I love creating comfortable environments, with attention to every detail, making sure our guests have a quality place to relax and enjoy their vacation. I have been doing this a long time and have a winning formula for designing, managing and providing a unique environment for our guests. It is quiet, private, yet close to town and all activities. Surrounded by mountains and fields, it provides a relaxing place to unwind. 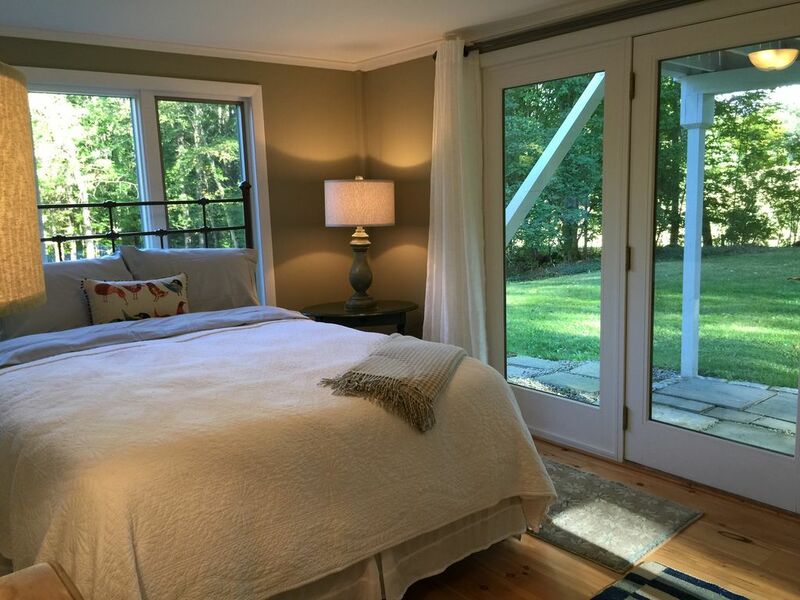 The best part, it is a short distance to the historic Village of Woodstock, close to shopping, skiing, hiking, antiquing, art galleries, restaurants and the wonderful Woodstock Farmers Market. Access to adjacent fields, trails and mountains, beautifully decorated, small and charming. Owner is right down the hill, available to solve problems, answer questions and insure that guests are well cared for. There are 3 zones for heating the house; living room, downstairs bedrooms, and upstairs master bedroom. Washing machine is in the cottage. Clothes dryer is in the cottage. There is a detached 2-car garage. One bay is occasionally used by the owners to store a classic car. Renters may feel free to use the second bay for parking, if desired. Wi-Fi is throughout the house. Once in the cottage, there is a notebook with instructions on how to get connected. Lush, Egyptian cotton towels are provided. The Woodstock Recreation Center provides a beautifully equipped gymnasium, available for visitors for about $5. They also have two swimming pools open to the public. A new, gas-log burning stove has been installed in the living room, providing a live flame ambiance to the room for our guests enjoyment. It is managed through a remote control and instructions. Some renters leave salt & pepper and other spices. Renters are encouraged to bring their own. Comcast Cable is hooked up. Books are provided throughout the cottage; we ask that you use the "honor system," and after use, please return to the shelves. A limited number of board games are provided. We suggest you bring what you want for your own enjoyment. A random selection of video movies, most are older, but still enjoyable for guests to view. The property is maintained by our property manager, including mowing and garden maintenance. The deck is off the front of the house by the kitchen, as well as a smaller deck off the back of the house. Outdoor furniture and table with umbrella are provided. Ski areas close by: Killington, Pico, Okemo and Suicide Six. The Woodstock Country Club provides a beautiful golf course for use by the public. The Woodstock Recreation Center has two beautiful swimming pools, open to the public, with lifeguards on site. Thank you Barbara and Frank for being A+ hosts and so responsive. We spent a long holiday weekend at the house and skied at Killington. The house is beautiful, clean and cozy. All the linens and beds were great. The backyard was an oasis and the views spectacular. Our dog LOVED the snow....we were here for the 18"+ storm. The house is fully stocked and the gas stove was great for cooking breakfast and heating up pizza! We headed into town which was so close and charming....we absolutely can't wait to come back and will make this our winter place getaway for future trips. Thank you again for sharing your house! You and your family were perfect guests and we are so pleased that your stay was pleasant, even with 18+” of snow and sub- zero temperatures. Make plans to come back again. My family recently stayed in this lovely home and were very pleased with our experience. The home is well maintained, clean and well equipped with everything you need. I highly recommend for family vacations! The house was perfect for our family. Updated, clean and well stocked with everything we needed. Thank you for your kind remarks. We hope you will think of us the next time your travels bring you to Woodstock. Our family was thrilled to spend the weekend reconnecting in your warm and cozy home. The home is beautifully decorated and had everything we needed. Lots of throws to snuggle into while watching Netflix or football! The kitchen was well stocked with pottery dinnerware, plenty of pots & pans, etc. The hexagon dining table was perfect for our party of six to play cards at! The beds were comfy and we loved the natural light streaming in through the skylights in the master bedroom. Would highly recommended this lovely home hosted by Barbara & Caroline. Thank you for sharing your but of snowy paradise with us. This is a little gem! We've stayed in HomeAway properties before but never written a review as there was always some down side to the property, not this one! Barbara and family are so easy to contact and reply so quickly. The cottage is easy to find and once there, you are in your own little world, away from the main road and set in its own grounds. It was perfect for our dog who was free to go off leash and play to her hearts content. She loved watching the turkeys wander through the garden and even two deer stopped by one day. The cottage was spotlessly clean, beautifully decorated and comfortably furnished. Everything you need in the kitchen is provided, even a few basics like salt and pepper and olive oil, and we loved the crockery! We only needed to use one of the bedrooms, the upstairs one, which was so light and airy with a very comfortable bed. The cable TV and wifi are excellent, but it was just nice to switch off and enjoy the peace and quiet. Thank you so much Barbara for our wonderful few days in Vermont, we hope to visit you again soon.